Jesus is our Peace. Jesus is the entirety of God’s reconciled creation, His Kingdom already Come and still available to all. After 2000 years of study, for me it begs belief that what is written in scripture throughout, still remains unknown and unheard of, His Kingdom of Peace. I believe in Peace and the reason I want to share the Kingdom of Jesus is my love for People and the beauty of our world worth preservation. Peace prospers more while war destroys us all. Scripture says that we humans can learn war no more and I believe the scripture as true. I am not the most peaceable person on the planet nor do I ever want to be, simply content in doing better, not better than, but rather, doing his better way for my life. Jesus is our example to follow, and I believe that what Humanity believes to be true will determine our Human behaviour, a person’s truth will determine how that person will act and what that person will do and so what many believe many will do. The more that can identify with His Peace the more His Peace will be, as His Goodwill pours out amongst us all, all the more His Grace empowering our acts of kindness amongst us all, binding more together as we share His Love, Forgiveness, Grace and Joy. When is leadership going to return to serving rather than their current demand of service and lead. And how does one tell leadership of the error of its ways without the sound of judgement, other than to ask them to consider a different perspective even when leadership thinks it sedition to do so? When leadership refuses to learn then what for the leaders' followers and most church leadership still seek followers and numbers rather than pointing more to His Peace, The Spirit of Truth in and amongst us all. NT purity is measured in our goodwill in action, our grace and acts of kindness toward other People more so than our holiness to canon law. Humanity will never be perfect however Humanity can learn of the perfected way and Peace and Grace, Peace and Goodwill to all Mankind is His Perfected Way as I hear it as I read of His Story in scripture. Shouting the Name Jesus at other religions or the uninitiated and telling them that every knee will bow and every tongue will confess is not the best way to show the love of God that melts the human heart, and Christianity still has yet to Love another two thirds of the planet. We Believe in Freedom. It is truth that sets us free. Free to be ourselves. Free to dream and have aspirations of a better life for us all. And free to pursue it. Hope asks what’s better. Faith says here’s how. Freedom is we get to choose. 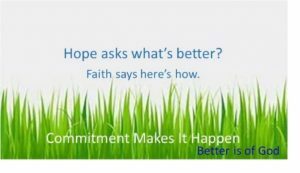 There is always a better hope on offer and hope leads us closer to God, and the revelations found in that better hope lead us on into faith, and faith to the bringing into manifestation the evidence of things not seen, and the substance of things hoped for. And if a faith, a faith unto who other than The Living God of All Creation, The Holy Spirit of God and the promise of Christ to lead us into all kindness and also into all truth, which is to say Love. When we all seek better. 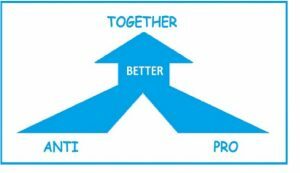 When we all seek better together then better together is what we will get, a better world for all always getting better. Better progresses excellence. Better progresses all. Better never ends. Better comes from God. Being willing to alter the traditional equation of consideration from only considering right from wrong, to also to include better as well, opens the door to the option of better new thinking, opens the door to all sorts of better new opportunities and potential, indeed an entire new way of thinking, in Hope, rather than by judgement. Hospitality overcomes Hostility. 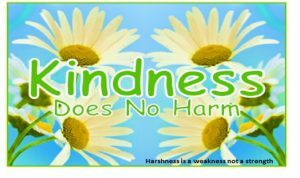 Kindness does no harm. It is our human kindness that displays the love of God. Humanity can overcome self-righteousness, violence, greed, discrimination and war, and be super-blessed, like that of Aaron or of Ordination, in the unity of Mankind knowing the truth of His Peace and employing the good news of the Grace of God expressed through our acts of kindness toward each other instead of finger-pointing so much at each other. 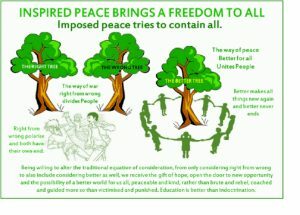 Endeavour to keep the unity of the Spirit in the bond of Peace. We All Have Access to God. Jesus started the equal opportunity moment amongst all Humankind and you can ask Him for Truth if you like, that’s the point, we are all already Children of God and all have the same opportunity to ask God for better and expect to receive a better truth in return. Humanity needs to work more toward our free democratic Peace not move further away from it and blindly go back into war again. In acceptance there lies peace because acceptance brings resolution, not compromise. Compromise is a tolerance and a tolerance is a divided stand-off not a united solution. The only compromise we should ever have to accept is in our own choice toward a goodwill measure for the greater good of all, our acts of kindness rather than being dutifully bound. What Will Mankind do with Peace? Jesus died the most violent of deaths that we may live in His Peace. 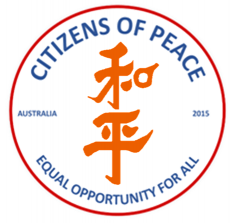 Peace is already within us and already we are fellow citizens. God is redeeming His Church bringing Her Home to Peace, reforming His Gospel of Peace, and renewing our lives in kindness. We can learn better how not to become offended, equally as we already learn how not to offend, and be resting in God’s Peace together, all of Humanity under the one banner of His Peace, The Peace declared since Melchisedec, through Solomon to Christ, and according to scripture and the author of salvation, Peace is, has always been, and always will be God’s Brand, Community and Way, for Jesus is the light of the world, the way, the truth and the life. 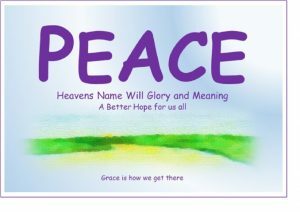 Peace is Heaven’s Name, Meaning, Will and Glory. Grace is how we get there. Peace and Goodwill to All Mankind. Peace and goodwill to all mankind is more a philosophy for life more so than simply a Christmas greeting. Peace and Goodwill to All Human Kind is the finished mission statement of Jesus Christ, King of Peace. Peace is the vision and Grace achieves it in truth and goodwill, Kindness. Peace is more than possible. It’s achievable. The Peace of us all, the binding of us all together as one in community, is founded on developing further an equal opportunity world for us all ordered by an equal access to education for us all, a truth that follows new covenant convention, as Jesus provided the pattern for our Peace in establishing an equal opportunity to education by establishing an equal access to God through placing a faith in God’s Spirit of Truth. All is forgiven, all can forgive so all have access, all can be guided and therefore all can learn of the better hope of the hope of better. 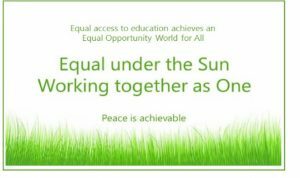 This is the endeavour to keep the unity of the Spirit that binds us together creating our Community in Peace in which we can live out the new and better way of Peace and Goodwill to all Mankind. Peace is Heavens name, meaning, will and glory, and Grace is how we get there, and the more that People identify and subscribe to it, then the sooner the more peaceable People will become. 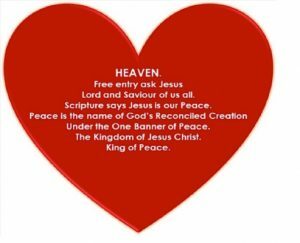 Jesus has a God Given Spiritual Kingdom that is being worked out and manifested in the physical, in and amongst us all, and the name of Jesus’ Kingdom is Peace. Be born again of Peace because it is the Kingdom of God, be born again of Grace because it is the means of God and be born again of Hope because it is the inspiration of God and so renew your mind, emotions and your will doing better instead, because we know that the law made nothing perfect because it’s for bringing order to the incivility of the villains, crooks, rogues and bullies, not to educate or edify the common Adult. 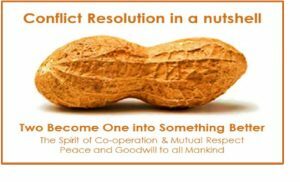 To promote Peace and Goodwill.